Renting your home should be as easy and trouble free as possible. We make property management hassle free and successful for you! 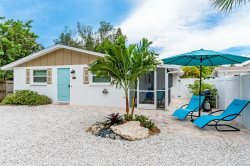 See what our established reputation and 49 years of service on Anna Maria Island can do for you! • Licensing – Setting up and renewing your local and state licenses. • Compliance – Ensuring your home has all of the items required by the Division of Hotels & Motels (fire extinguisher, hard wired smoke detectors, emergency exit floor plan and emergency lighting). • Resort Tax – Setting up your account with the state and county, collecting the taxes from tenants and filing taxes monthly. • Escrow Management – Collecting advance deposits from tenants and holding them in the required accounts. • Accounting – Monthly statements showing income, expenses and payments to owners. Year end IRS 1099 reporting showing yearly income. • Contracts – Confirming arrangements with tenants by getting signed Reservation Agreements which lists our terms & conditions (rates, tax, damage deposits, cancellation policy, payment and required disclosures). • Advertising – Your home featured in our Color brochure, on our Vacaton Rental Website and listed on the TripAdvisor network. Our company is also advertised with the Anna Maria Island Chamber of Commerce Visitors Guide, Manatee County Travel Bureau, Visit Florida Guide and website, Google Ads, Facebook, local, national and international publications and years of repeat customers. If you have your property listed on HomeAway, VRBO, Airbnb we can also help you manage your property as well. • Maintenance – After hours emergency number, trouble shooting problems, using owner approved vendors, direct owner contact, arranging cleaning of properties, pre-season walk through. • Customer Service – Our reputation for going "above and beyond" with both our owners and our tenants is the reason we have had long term relationships with both. We have two full time rental agents that are available for you and prospective tenants. We pride ourselves on being fair and honest! We follow up on concerns and complaints. You are not just another property, we know our owners and our properties. We offer personalized service to both our owners and our tenants. • Miscellaneous – Long distance phone calls, postage, yard signs, showing your property — some things you may not have thought about that we do to help market your property! © 2019 | Fran Maxon Real Estate - All rights reserved.